This paper reviews the extant research on the effects of contact with terrorism media coverage on psychological outcomes in youth in the context of chronic threat and conflict in Israel. The extant research is inconclusive with respect to the relationship between media contact and a variety of psychological outcomes in Israeli studies of youth exposed to ongoing threat and repeated terrorist attacks. Additional research is needed to examine potential differences in outcomes and the factors that influence youth coping and adaptation in an environment of chronic threat and extensive media coverage. Moreover, studies are needed to identify and evaluate potential parental, professional, and social strategies to enhance youth adjustment. Because political conflict in Israel is not likely to abate in the near future, the setting is ideal to conduct methodologically rigorous research including research using representative samples, prospective reporting, and longitudinal design. The editors would like to thank Dr. Orna Braun-Lewensohn for taking the time to review this manuscript. Betty Pfefferbaum is a section editor for Current Psychiatry Reports. This article does not report new data in studies with human or animal subjects performed by any of the authors. • Houston JB. Media coverage of terrorism: a meta-analytic assessment of media use and posttraumatic stress. Journal Mass Commun Q. 2009;86(4):844–61. https://doi.org/10.1177/107769900908600408. This meta-analysis of 23 studies of terrorism media coverage and posttraumatic stress outcomes found a significant effect. Effects were greater for studies examining posttraumatic stress symptoms or reactions relative to those examining posttraumatic stress disorder (PTSD), for studies examining coverage through multiple media forms relative to those limited to television coverage, for studies of youth rather than adults, and for studies of samples located further from the event relative to samples within the city where the event occurred. • Pfefferbaum B, Newman E, Nelson SD, Nitiéma P, Pfefferbaum RL, Rahman A. 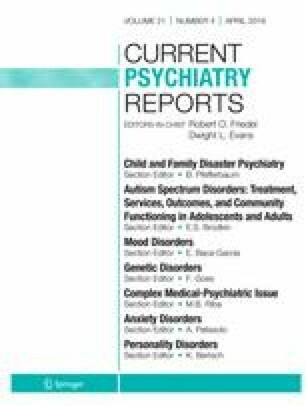 Disaster media coverage and psychological outcomes: descriptive findings in the extant research. Curr Psychiat Rep. 2014;16(9):464. https://doi.org/10.1007/s11920-014-0464-x. This literature review described the events, sample, and forms of media coverage studied in the extant disaster media research and examined the association between media contact and psychological outcomes. The analysis found evidence for a relationship between television coverage of disasters and various psychological outcomes but indicated that there are too few studies to draw conclusions about a relationship between outcomes and contact with coverage through other media forms. •• Pfefferbaum B, Tucker P, Pfefferbaum RL, Nelson SD, Nitiéma P, Newman E. Media effects in youth exposed to terrorist incidents: a historical perspective. Curr Psychiat Rep. 2018; 20(2):11. DOI: https://doi.org/10.1007/s11920-018-0875-1. This paper reviewed the evidence on the relationship between contact with media coverage of single terrorist incidents and psychological outcomes in youth and traced the evolution in research methodology. The research, characterized by increasingly sophisticated research methods over time, supports a relationship between media contact and various outcomes in children with different event exposures but concluded that there is insufficient research to assume a causal relationship. • Lavi T, Itzhaky L, Menachem M, Solomon Z. Adolescents on the front line: exposure to shelling via television and the parental role. Psychiatry. 2016;79(1):85–94. https://doi.org/10.1080/00332747.2015.1084471. In this study of Israeli adolescents, contact with television coverage of terrorist attacks was not related to posttraumatic stress or distress. Parental intermediation was not effective in ameliorating PTS, but appears to have been effective with respect to general distress in adolescents who reported the lowest levels of actual exposure to attacks. • Braun-Lewensohn O. Coping and social support in children exposed to mass trauma. Curr Psychiatry Rep. 2015;17(6):46. https://doi.org/10.1007/s11920-015-0576-y. This paper reviewed studies of youth coping in the context of mass trauma published between the years 2011 and 2014 and proposed a comprehensive model for better understanding the process of coping with these events. The paper recommends that future research emphasize the youth’s developmental stage, the cultural context and environment in which the youth reside, and the type of event (acute vs. chronic; natural vs. manmade).